Jarrow Formulas® Grass Fed Whey Protein comes from South Australian cows, which are fed grass year-round, nor treated with growth hormone (rBST) or antibiotics. South Australia has a temperate climate, which allows the dairy cows to roam the open pastures, untainted by pesticides. Grass Fed Whey Protein is a good source of calcium (100 mg per serving) and rich in essential amino acids (9.3 g per serving). Grass Fed Whey Protein is rich in essential amino acids, ranking it with egg as one of the highest quality protein sources available. 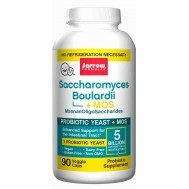 • recombinant BST and antibiotics-free . Jarrow Formulas Grass Fed Whey Protein comes from South Australian cows fed grass year round and not treated with growth hormone (rBST) or antibiotics. South Australia is a temperate climate zone, which allows the dairy cows to roam the open pastures, untainted by pesticides. Grass Fed Whey Protein makes available one of the highest quality proteins known. Protein is the primary nutrient group involved in repairing and building muscle tissues. 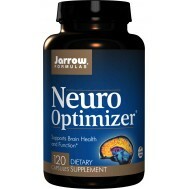 It is also the only nutrient group that contains an appreciable amount of nitrogen. This is important since the body must be in a state of positive nitrogen balance in order for muscle growth to take place. On the flip side, negative nitrogen balance can cause the body to break down muscle tissue as a source of protein for other uses resulting in decreased muscle mass. While any source of protein can provide protein, whey protein has some distinct advantages. Whey protein is a mixture of globular proteins from milk. It has a complete amino acid profile as well as other beneficial factors such as alpha-lactalbumin, beta-lactoglobulin, lactoferrin, serum albumin, lysozyme, and immunoglobulins A, G, and M. Whey protein also tends to provide a higher concentration of essential amino acids than other protein sources. Typically about 25% of the amino acids in whey are branched chain amino acids (BCAAs). BCAAs are readily oxidized as an energy source during and after stress and exercise. Whey protein is also rich in cysteine, a precursor to the vital intracellular antioxidant glutathione (GSH). GSH is depleted by oxidative stress that occurs during exercise, immune defense, and healing. In fact, some researchers think that whey protein may help play a role in promoting immune health by providing GSH precursors and increasing levels of GSH in the tissues. What Type of Whey Protein Is Best? The debate about “the best type” of whey protein is a topic of infinite discussion on message boards pertaining to bodybuilding. Typically, one form or another is advocated based solely upon the manufacturing method used to produce it. For instance, whey protein isolate (WPI) is often touted as being a “purer” form of whey because it typically goes through more processing steps resulting in lower carbohydrate and fat content. Whey protein concentrate (WPC) is often processed in a very similar manner to WPI, but is less processed with a slightly higher retainment of lactose. Many clinical studies on the effects of whey protein supplementation have been conducted on the use of WPC, especially in the areas of weight management and immune health. Also, the source of whey may affect the quality and product purity of the nutrients of supplements. For example, whey protein concentrated from grass fed milk has fewer contaminants such as added hormones and other environmental toxins. The type of whey protein chosen is a matter of personal choice but, when evaluating the quality of a whey protein product, one should carefully inspect the supplement label to determine ingredient sources, processing methods, quantity and quality of each amino acid and other nutrients. 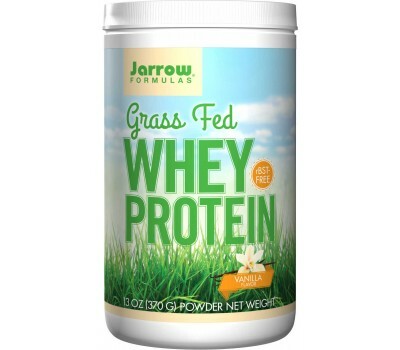 Jarrow Formulas Grass Fed Whey Protein is a whey protein concentrate from grass fed cows and is free of recombinant bovine growth hormone (rBST). 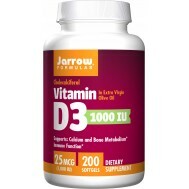 It is minimally processed to retain protein’s natural integrity, and wellness-supporting minor fractions such as lactoferrin and other immunoglobulins. The whey protein is ultra filtered to remove greater amounts of lactose and fat from the final product, and it is free of any artificial flavors, colors, or sweeteners. 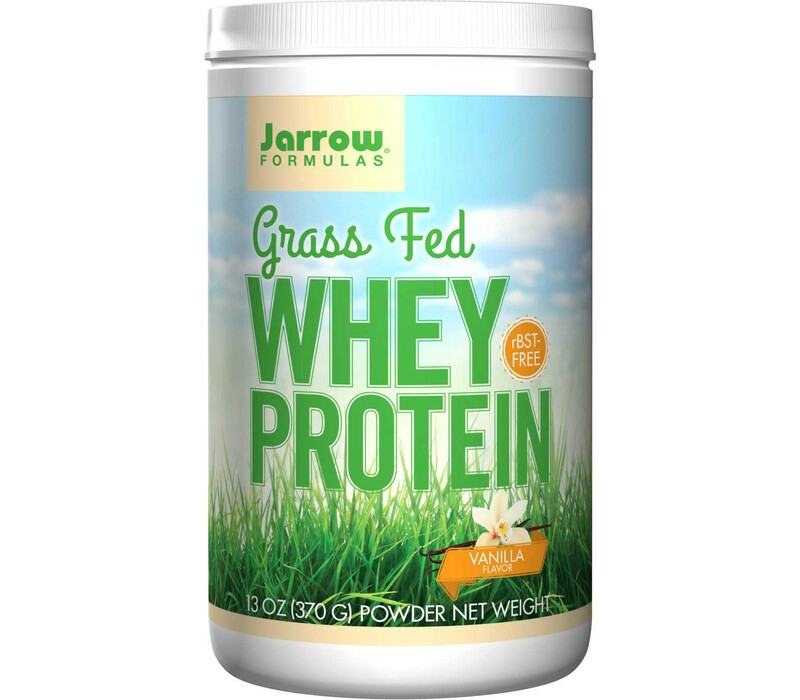 Jarrow Formulas’ Grass Fed Whey Protein is a 100% natural grass fed protein concentrate of whey from cows not treated with growth hormone (rBST) and is ultra filtered to be low in fat, lactose and carbohydrates. 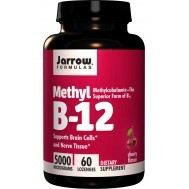 It is a rich natural source of BCAAs (isoleucine, leucine and valine). 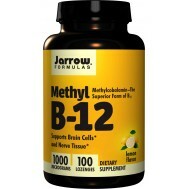 Each scoop of Jarrow Formulas’ Grass Fed Whey Protein provides a total of more than 4 grams of BCAA. No other source of protein provides as much BCAAs as whey. Jarrow Formulas’ Grass Fed Whey Protein is available in three flavors: chocolate, vanilla and unflavored. Mix one heaping scoop (approx. 25g) with 150-180 ml6 to 8 oz. of cold water, almond milk or your favorite beverage. For a protein smoothie, blend with crushed ice and add juice or fruit to taste. 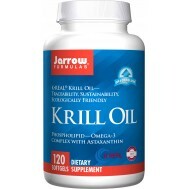 As an alternative, may also be used with cereals, yogurt or pancakes.